Fitted bedrooms England - what are the benefits of them? Fitted bedrooms England – what are the benefits of having fitted wardrobes? Here at Starplan, it’s no surprise that we’re all about fitted bedrooms England! We have 4 showrooms across England. We’re very proud to show off our showrooms as they all contain an impressive range of fitted bedroom displays. If you haven’t been to visit one of our showrooms, what are you waiting for? They’re all open seven days a week. You can find more information here! This weeks blog is all about the benefits of having a fitted bedroom England and fitted wardrobes over freestanding furniture. Our fitted bedrooms are created for you and your room. They will be individually designed to fit your space and to include all the elements of a fitted bedroom that you could want or need! All of our bedroom and wardrobes are manufactured in our own factory showroom based in Dungannon, Northern Ireland. The fact that we manufacture our own products means that we can cut out the middle man, we can create bespoke items for you and we can provide only the highest quality of products. It also means we can offer the best prices straight to our customers. Another benefit of built in wardrobes in fitted bedrooms is that they are created to be timeless! 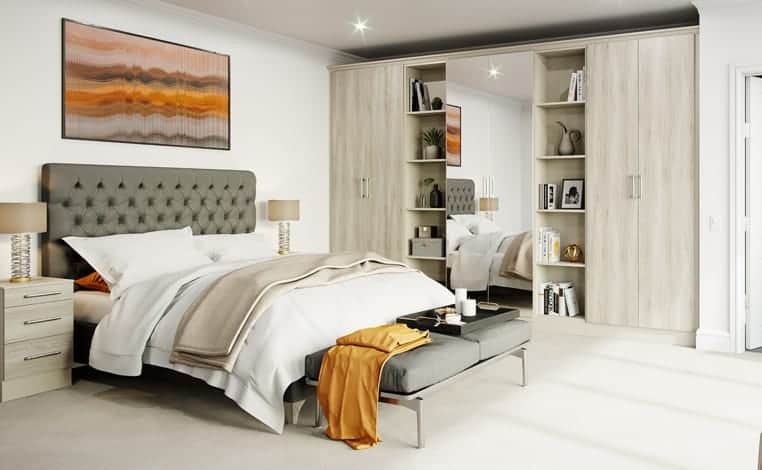 So it doesn’t matter whether you’re looking for a modern, sleek bedroom or if you want something that ticks the traditional boxes, we can create something that works for you. Why not push the boat out that little bit more and look into replacing the standard wardrobe doors with sliding wardrobes doors instead? They are space saving and they can be personalised with different finishes, colours and even mirrors! So if you’re interested to see what we could create in your bedroom, get in touch with one of our team today! We can set up a free, no obligation home design visit for whenever will suit you. Kitchens Dungannon – have you ever thought about using black in your design? Fitted bedrooms England – An amazing range of designs to suit you!